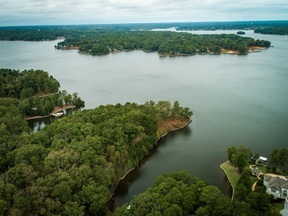 Nestled among the Georgia pines and situated along 374 miles of Lake Oconee shoreline is Reynolds Lake Oconee, an upscale gated, golf and lake community. Reynolds Lake Oconee is home to 6 golf courses, an avid golfer’s dream. Reynolds Lake Oconee draws non-golfing residents as well, for they offer unparalleled world-class amenities including 9 culinary venues, fitness centers, 21 miles of walking trails, tennis courts, basketball courts, bocce ball courts, swimming pools, marinas and more! Reynolds Lake Oconee properties include lakefront homes and lake access lots, golf course homes and lots, wooded interior homes and homesites, lake access homes and lots, and cottages, condos or villas. There is no doubt that Reynolds Lake Oconee has a property suitable for everyone. Reynolds Lake Oconee offers six courses with 117 holes for play. The Preserve Course (formerly the Plantation course) was designed by Bob Cupp, in conjunction with golf professionals Fuzzy Zoeller and Huber Green. It opened in 1988 and was immediately recognized as one of the top 10 new resort courses in the world. The Bob Cupp course is characterized by a natural, rolling layout that possesses many subtleties. The Great Waters course offers players some of the most dramatic golf scenery in the southeast. This course was designed by Jack Nicklaus and opened in the fall of 1992. This course is ranked among the Nation’s finest. 9 of the 18 holes play along the shores of Lake Oconee. Tom Fazio’s National Course, boasting 27 holes, features impressive elevations and wonderful views. Several holes were added in 2000. The Landing course, formerly Port Armor, opened its course for play in 1986. Designed by Bob Cupp, it has continually ranked in the top 10 courses in Georgia. The course demands respect from its players and offers some breathtaking views. In summer 2005, Reynolds Lake Oconee purchased Port Armor and renamed it Reynolds Landing. The Oconee Course uses the combination of stunning terrain and an excellent routing plan to create an abundance of exciting golf. Rees Jones has created a classical masterpiece that resort guests will truly enjoy and return to play again and again. Paired with the Ritz Carlton Lodge and the new Dave Pelz Scoring Game School, both are adjacent to the Oconee course and offer an unbeatable package for golf enthusiasts. The Creek Club is the newest course at Reynolds Lake Oconee and it is the first private “Members Only” golf course. The course opened in June of 2007 and was designed with rolling bunkers, zoysia grass fairways, and striking water features. Designer Jim Engh, also referred to as the game’s “Hottest Designer” by Golf Digest, was honored as the magazine’s first ever “Architect of the Year” in 2003. The Creek Club is a contemporary, thrilling golf masterpiece. Below are some Reynolds Lake Oconee homes for sale and Reynolds Lake Oconee lots for sale. To schedule a showing or to request more information, contact The Vining Group at 706-816-1010.